I really have become fascinated by the Core'dinations cardstock. Earlier this week I shared a card I made using the "black magic" variety (here is a LINK to that post). 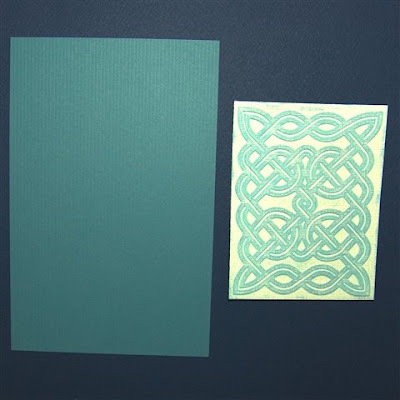 Today I thought I'd show you the "whitewash" Core'dinations cardstock (here is a LINK to their site where you can see all of the varieties). 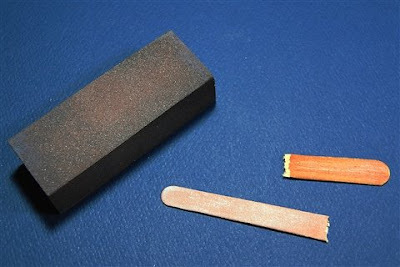 When I did the "black magic" card, I used this sanding block - which was really too fine a grade and it made it difficult to remove the color quickly. A blog reader (hi Marjorie!) wrote to me to say that she had used an nail file (emery board) and that it worked very well. So I tried that and it was faster and easier (I did break it as you can see above!). If you really want to get the most out of your new Core'dinations ColorCore Cardstock make sure you sand it with 150 or 180 grit sandpaper. If you're using another grit, you're either missing out on the vibrant ColorCore or causing yourself extra work! It always pays to read a manufacturer's site to find their recommendations for using the product! So for my next card I will raid my husband's workbench to find the right sandpaper. 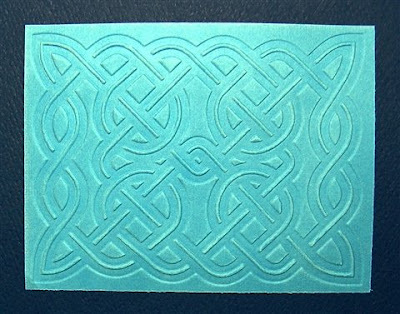 I used my new Celtic Knot A2 cuttlebug embossing folder. I cut the piece of Core'dinations whitewash paper to 4 x 5 1/4 inches to layer on an A2 card. I had some Bazzill cardstock for the card base that is very close in color to the core color of this piece of Whitewash cardstock. 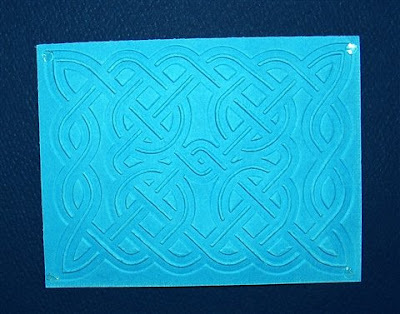 Here is a closer view of the embossing and sanding. 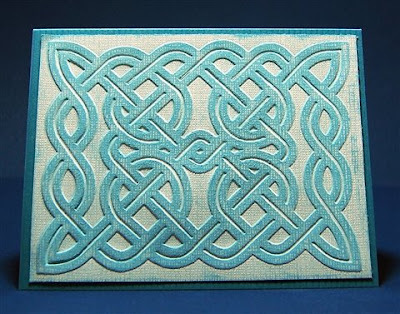 This is a complicated design and it looks good from both sides - there is embossing and debossing on each side to create the pattern of the knot. 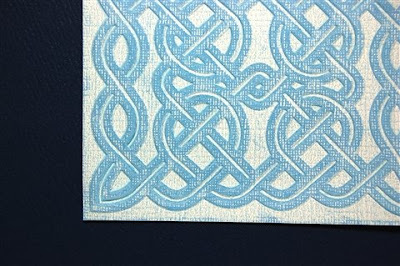 When I want to put an embossed layer on a card I put the adhesive directly on the card base so I won't press too hard with the tape gun and flatten the embossing. 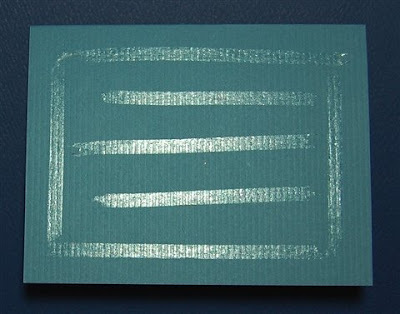 Since it is difficult to get the tape exactly where the corners will fall on the card, I put a small glue dot at each corner to keep the corners firmly adhered. 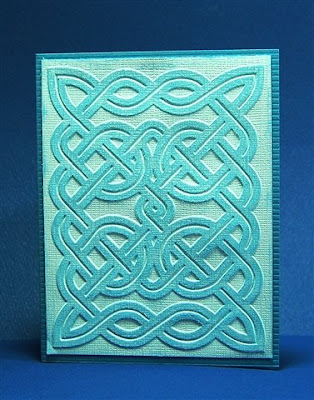 This design will work for a vertical (above) or horizontal (below) card. I thought the design was so pretty that it would be best to leave it plain with no embellishments. These would make lovely notecards. Jen and I have scheduled three classes for next week - with our time off for medical/personal stuff last week we didn't allow enough time this week for sign ups so we moved the classes ahead a week. We expect to have some new and different classes ready to go for the following week (we know that there are a number of you who have taken all three classes and are waiting for some new ones to be available). If you want to take the Getting Started , Basic Cards, or Wordbooks classes please register following the directions on the Let me Show you How to Do that blog. I have recently received a couple of interesting packages in the mail - check back in a few days to see what was in them and what I do with the contents! (I wish one was a Gypsy to test - but no such luck...).